One sunny Friday afternoon in San Antonio when the weather was warm but not too hot, two ladies went to lunch. They grabbed a table for two right next to the water shaded with an over-sized umbrella and began to browse the menu. Those two ladies were my Noni and I and it didn’t take very long to decide what we’d be eating for lunch that day. Boudro’s on the River is a Texas bistro that feels more like a French bistro. Like most restaurants along the riverwalk, there’s indoor and outdoor seating to cater to all weather and it has an almost upscale feeling to it. The cafe tables are elegant, like the nice cafes on the streets of Paris, and the waiters wear classic outfits and treat you as if you’re eating at the best fine dining establishment. I can honestly say that I’ve never been more pleased by a restaurant’s service before. We gave our waiter a run for his money too, that’s for sure. My Noni fasts on Fridays, only eating fish or vegetarian immediately limiting her menu choices. Then, sometime during our meal a bee decided to become friends with us which immediately had me in a tailspin. Our waiter came over, and got rid of it without blinking an eye. Eliminating bug threats is a sure way to become one of my favorite people! After perusing the menu, my Noni decided on the Blackened Yellowfin Tuna Salad and I chose the Duck Spring Rolls. 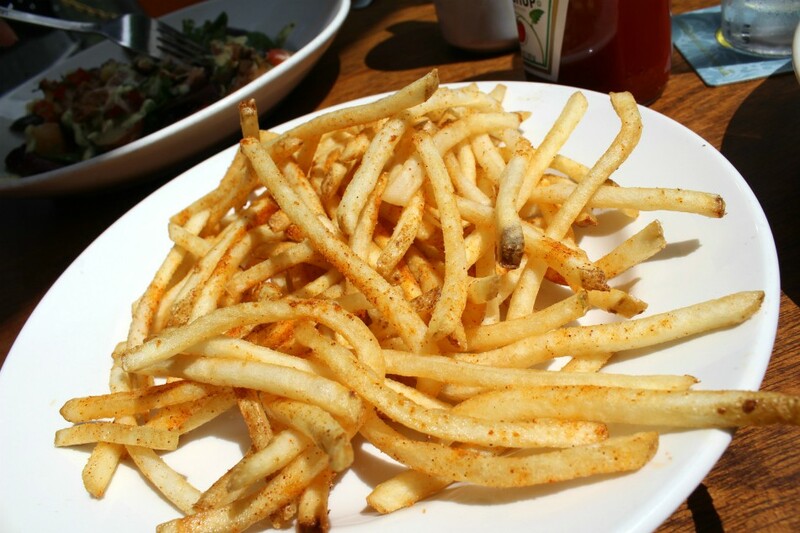 The both of us decided to splurge on the Fire Fries (a whopping $3) because they sounded absolutely divine and…#Fryay! The Blackened Yellowfin Tuna Salad comes with haricot verts, roasted red potatoes, mesclun lettuce, ruby red grapefruit, maple vinaigrette, Serrano honey aioli and pineapple pico de gallo. It’s actually a nice, hearty salad...perfect to fill you up for a day of sightseeing until you’re ready for a late dinner. The tuna is seared in strips, layed on a bed of vegetables and topped with the delightful pineapple pico de gallo. My Noni encountered her second food challenge on this trip (the first was trying guacamole and avocado for the first time) when she realized the tuna was seared and not the kind you get out of a can. Being the brave foodie I’ve turned her into, she took a bite and was pleasantly surprised to find out that she likes seared tuna! I was glad because you couldn’t have pried the spring rolls out of my hand if you tried. The Duck Spring Rolls were an unexpected delicacy that I would eat over and over again. Crispy fried confit of duck is served on a bed of mixed greens with ginger soy vinaigrette and apricot dipping sauce. Let’s start with the rolls because there are a few things to point out in this dish. The actual spring rolls are filled with a scrumptious, borderline indulgent duck confit along with vegetables. They’re light yet incredibly satisfying and the portion is absolute perfection - just enough to fill you up but so that there’s room for dessert. The ginger soy vinaigrette was a sweet yet tangy dressing for the salad that brought a much needed brightness to the dish. And finally, that apricot dipping sauce is something dreams are made of. It was a unique dish that I haven’t seen served anywhere else since and if I ever return to San Antonio, I’ll definitely be ordering it again. Of course, all these was accompanied by a shared side of Fire Fries, thin-cut French fries with seasoning. I would have been happy indulging in a plate or three of these but glad I decided to go the spring roll route. If you have room for dessert...head upstairs to the Ben & Jerry’s. This particular opportunity is not lost on someone who has never seen the famous ice cream brand outside of a grocery store freezer. They have lots of different flavors and treat options for even the strongest of sweet tooths. If you have a Ben & Jerry’s where you live and prefer to try something else, there’s a homemade ice cream shop right next to Boudro’s called Mr. Ice Cream. With 37 flavors in an old-fashioned parlor, it’s hard to beat!